After attending a Zig Ziglar conference for her husband’s business in 2012, Heather Nichols was inspired to springboard from her corporate sales career directly into entrepreneurship. Since beginning the self-employment adventure, she’s enjoyed the freedom of seeking out business and personal development through coaching, conferences, and networking. Along this journey, Heather founded The Biz Fizz Online Marketing and is the Inner Circle Manager to the Queen of Facebook, Mari Smith. Although Heather helps businesses locally, nationally and internationally to connect with their target markets online (with a specific skill set in Facebook lead generation), her favorite thing is presenting and connecting in person, believing that relationships are life’s most valuable commodity. Teaching and public speaking are some of her favorite things. She’s an active member of the Rockwall Area Chamber of Commerce, is on the Chamber board for the Executive Women’s Alliance, is a member of The American Marketing Association and Master Networks, and she’s a regular contributor to the discussions at the Social Media Breakfast of Dallas. When she’s not working on her clients’ marketing plans or her own business plans, you can find her spending time with her husband on the tennis court, taking frequent family weekend trips to East Texas or eating peanut M&M’s at the movies. 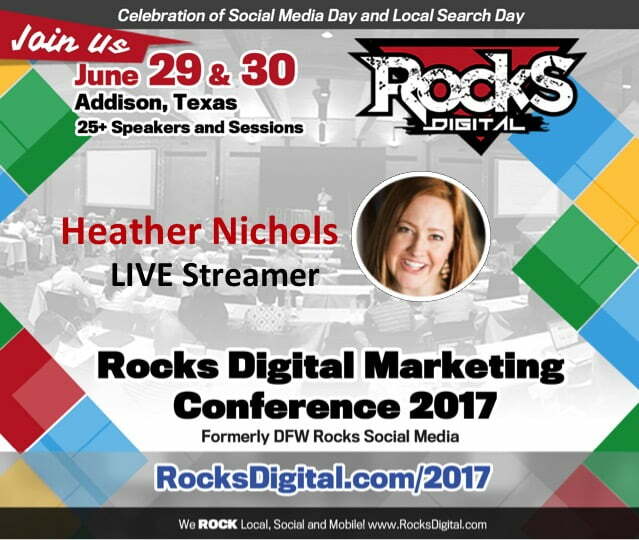 The enthusiastic and energetic Heather Nichols will be live streaming attendee and speaker interviews on the Rocks Digital Facebook Page. 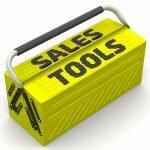 Make sure you “Like” the page. Don’t miss this! #RocksDigital 2017 @theBizFizz to Live Stream Interviews from Rocks Digital Facebook Page! 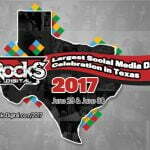 Will you be following Rocks Digital during the conference?